Today marks a month until Sydney Bar Week and we have a bunch more new brands that will be landing on Sunday, 16th September at Indie Spirits Tasting Sydney at Restaurant Hubert. Get your Early Bird tickets here now. There are nearly 50 exhibitors showcasing more than 150 products covering everything from Mezcal to Amaro and many of the brands are brand new to market. So, here a just a few of the more of the newbies to note in your Bar Week hit list. First up is Affinity Gin by Karu Distillery. A well balanced representation of 11 botanicals collaborating to bring you a delicious sensory experience. Their botanicals are predominantly Australian grown with a few of the international greats joining in. They recommend garnishing with rosemary, apple or a dash of grapefruit bitters. Check it out at the Karu Distillery table. New from Antica Torino, Amara della Sacra blends leaves, flowers, seeds, roots, spices and barks, some typical of Piedmont such as gentianella and hops, others more exotic, including vanilla of Madagascar, green cardamom of the Indies, myrrh of the Middle East and chinchona bark of South America. The label depicts a Benedictine monk intent on the study of an ancient text, entitled ‘Vox Dei Silentium’, meaning ‘silence is the voice of God.’ In the background is the Sacra di San Michele, an ancient abbey perched on the summit of Mount Pirchiriano, near the city of Torino. Check it out at the Trembath and Taylor table. 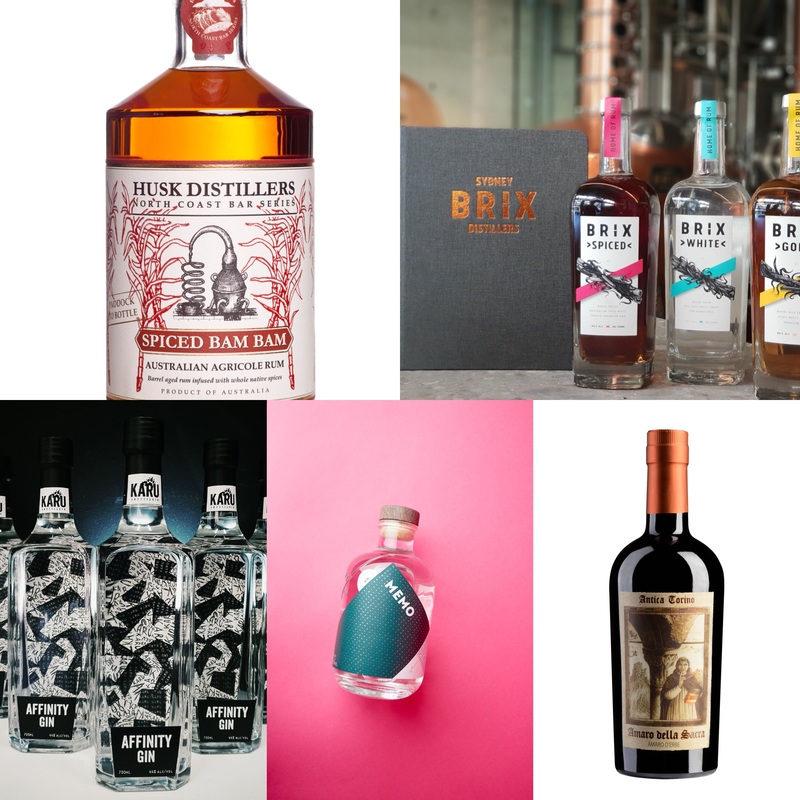 Brix Distillers will be showing two products at Indie Spirits. The first is their white un-aged molasses base spirit named ‘Brix White’. The product is fully produced in their Surry Hills Distillery from 100% Australian molasses. We will also be showing our ‘Brix Gold’, a blend of 5-8 year old molasses based rums, produced and aged in Barbados and blended to their specifications by Master Blenders in Holland. “This is an expression of what we are looking to produce after our white product has aged in oak barrels from local NSW wineries,” says James Christopher, co-founder and ops manager. Both products are brand new to the market and will be available at the distillery. Check them out at the Brix Distillers table. The folks from Melbourne Moonshine have released MeMo Gin which is their first ‘house’ Gin release. Following on from the successful release of the Campos Cascara Gin, they decided to do it again. This time with a few tweaks. They removed the colour, added a little more cascara and more navel oranges. The end result is a perfectly balanced Melbourne Dry style gin. Not overly complicated but instead sophisticated in its subtle finish of Juniper and Cascara sweetness. Check it out at the Melbourne Moonshine table. Husk Distillers will be showcasing their brand mew Spiced Bam Bam which starts as a 3-4 year old barrel aged Australian Agricole rum, which is then infused over 6 months with whole botanicals. Roasted Australian wattle seed, local native ginger and sun-dried orange and mandarin peel combine with golden berries, whole Tahitian vanilla beans and cinnamon quills to create a unique spice flavour rounded and balanced with a sprinkle of local sea salt. The result is a spiced rum good enough to sip neat or on the rocks, or if you prefer with ginger ale, tonic water or in a variety of cocktails. Have a taste at the Husk Distillers table. Stay tuned for more on Indie Spirits Tasting Sydney. In the meantime don’t miss out on your Early Bird Tickets for just $35 (plus fees). Click here to book.